Vinyl Coated Chain link Fence Systems are the complete solution for residential, commercial and industrial needs. The system includes mesh, pipe, and fittings .Its very easy to estimate the cost of your project. You just need to know the total running footage you need and enter it into cart at the Shop online link below. The system price includes all the line posts, top rail, Mesh and all hardware. Then enter number of Corner posts for the corners you have in your layout, and add those to cart, same with end posts, which also are the same as gate posts, and finally select the gate kits for height and size and update your cart. From the shipping calculator add your zip code and Shipping method and click apply. 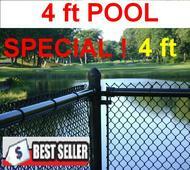 Your total cost will appear in the cart Pool Fences require a mesh with openings of 1 1/4" opening. 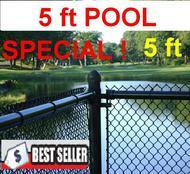 Select Pool Fence System above in 4ft or 5ft.